Superb Grandfather clock in Walnut. Westminster, Whittington & St. Michael chimes on the quarters and hour striking on nine Tubular Bells. Impressive Walnut finish floor clock with elaborate inlays, Walnut burl surrounds the pediment and base, bevelled crystal glass, exclusive moon dial with applied milled and gold plated decorations and Arabic numerals, 27 cm lyre pendulum. Kieninger 0117-82-02 - 0 Delivery about two weeks directly from Kieninger. HTU 06 Triple Movement - Westminster, St. Michael and Whittington chimes on Nine tubular bells. Kieninger Top of the Range Triple chime movement plays the Westminster, St. Michael & Whittington melodies on 9 polished tubular bells. Technical specifications; 24 bronze bushings for the cable drums, counterlock, minute wheel pinion, 2nd wheel, heartwheel, centershaft and strikestar pinions), 12 jewels (genuine rubies) for the bearings of the fly wheel, fly wheel drive, escapement and anchor pivots. Pallet anchor with a Graham dead beat escapement, automatic beat adjustment to provide an even Tick, cable winding stops to prevent over-winding. The movement incorporates a maintaining power device to keep the pendulum swinging during rewinding. There are two separate selection levers on the dial to control the hour chime and melody selection. Movement servicing requirements. A lubrication every five years and a clean at ten yearly intervals will ensure excellent reliability and an extremely long life! 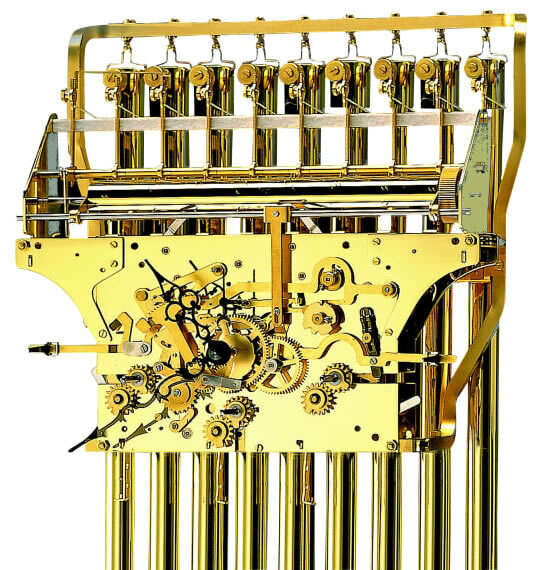 Oakside now provide an expert servicing and repair service for all Kieninger movements. .. Register as an Oakside Account Customer and you will qualify for a loyalty discount on your next order..
Click here to view the Kieninger 0117-82-02 Options and Prices page. Click here to return to the Kieninger Clock Gallery page.